Made from a glorious french brocade with a rose embroidered pattern which is both textured and special. Wide legs with side pockets and small turn ups. With a partially elasticated waistband at the back and straight waistband at the front. Extremely comfortable, elegant and flattering. 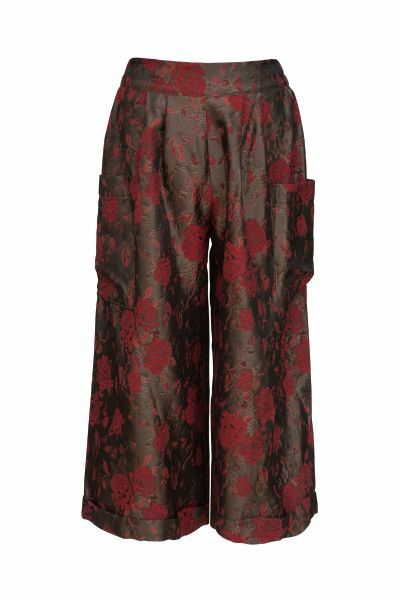 The Tatiana trousers in Rose Brocade are a new take on an old style. With extra wide legs they are nothing short of fantastic. The waistband has two rows of elastic at the back and is left flat at the front for a neat look. Large patch pockets sit at the side of each leg for putting sweets in. Tatiana has turn up cuffs and skims just above your ankle. She is fitted at the waist and flares out with style. TO CARE FOR YOUR TATIANA ROSE BROCADE TROUSERS, PLEASE HAVE THEM PROFESSIONALLY WET CLEANED. WE WOULD RECOMMEND WASHING AT 30°. DO NOT TUMBLE DRY YOUR ROSE BROCADE TATIANA BOTTOMS. PLEASE DO NOT BLEACH. IRON ON WARM ONLY. FOLLOW THESE STEPS AND YOU WILL HAVE A VERY HAPPY TATIANA.